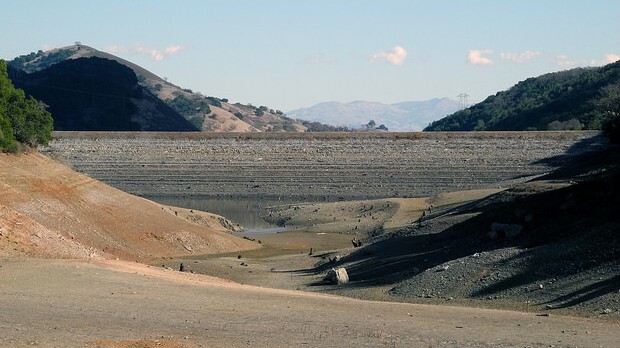 California's Drought: Is it Global Warming? Federal climate scientists say that California's drought, now in its fourth year, is not likely the product of human-induced global warming. A new report, based on seven models that ran 160 "reenactments" of the last three years, concludes that "perhaps about two-thirds of the precipitation deficits" of the last three years have been the product of various convergent factors, including "a randomness of the atmosphere," says Marty Hoerling, a climate scientist at the National Oceanic and Atmospheric Administration's Earth System Research Laboratory and one of the study's co-authors. In other words, it's been mostly natural variability, which is science-speak for the random year-to-year fluctuations in precipitation that we would normally expect. Most climate models show that rising greenhouse gas emissions should produce more intense precipitation during California's core mid-winter "rainy season" and less during the spring months, creating what lead author Richard Seager of Columbia University calls a "shorter, sharper rainy season." That hasn't been happening in recent years. Therefore, says Seager, "The events of the last three winters were primarily due to the natural variability of the atmosphere-ocean system." The report has drawn fire from some scientists and commentators who say that it leaves out the effects of record-high temperatures in California this year. Brenda Ekwurzel, senior climate scientist at the Union of Concerned Scientists, wrote in a response that, “The NOAA study points to natural variability, but it is important to note that these random variations are happening in the context of higher overall temperatures caused by climate change and warmer temperatures spell trouble for water in California." It's well understood that high temperatures tend to exacerbate drought impacts, baking moisture out of the ground through increased evaporation and transpiration by plants. Seager says the "main driver" of the drought has been lack of precipitation, which defied the predictive models amid rising carbon emissions, but he and Hoerling agree that it would be useful to "continue the analysis by looking at the land surface hydrology and working out what the role of increasing temperature was," as Seager put it to reporters in a conference call. Hydrologist Peter Gleick of the Oakland-based Pacific Institute says the NOAA report lends itself to misinterpretation because of the "fundamental difference between 'cause' and 'influence.'" "Asking whether climate changes 'caused' the current drought is simply the wrong question," Gleick wrote in an email to KQED. "While there remains plenty of interesting science to be done about how climate changes will cause extreme events in the future, we already see today a growing and clear influence of climate changes on storms and droughts around the world. The influence of human-caused climate change is already apparent." The NOAA scientists acknowledge the historic nature of the drought itself. Seager describes it as "one of the most severe" since 1895, when the state began keeping precipitation records. Even with December coming down on the wet side so far, it's impossible to say whether this winter will extend the drought or help bring an end to it, according to Seager and Hoerling. "In the last three years, California lost essentially one whole year's worth of precipitation," Seager notes.